The vehicle mounts by Jotto Desk have a unique nylon coated aircraft cable system that holds the laptop securely in place on top of six foam shock pads. These shock pads allow for airflow between the laptop and tray and provide a non-skid surface for extra security. The telescoping pole and the patented articulated swing arm provide the flexibility for comfortable use by the driver, passenger or outside the passenger side door. There are several vehicle mount styles available whether you have a car, pickup, semi or RV and all come with a one year warranty. Jotto Desk mounting solutions have developed a loyal following and have become the solution of choice for fleet managers. Solid 1 Piece Base connects under the passenger seat rails and fastens securely to the floor bolts, with No Drilling required! The Tube and Rod, used for vertical height adjustment, is easily adjusted with the use of the Soft Touch Knob and Screw. 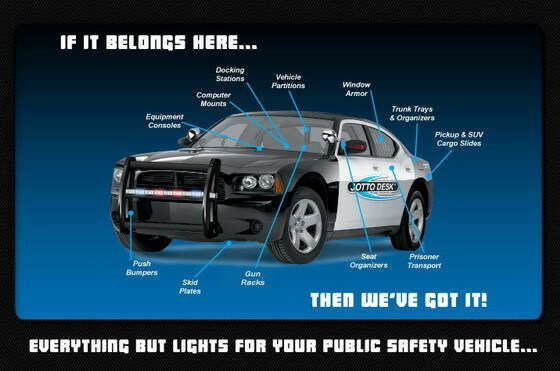 This will allow the laptop Desk to clear the center console in your vehicle. The Articulating Swing Arm provides horizontal adjustment, so that the laptop can be positioned for comfortable use by either driver or passenger. The laptop Desk swing arm, and desk top are locked in position with the use of "Ratchet Handle" tighteners. Your laptop can be attached or detached in seconds, from the desktop, with the use of the patented Cable Dock™ laptop attaching system. This superior holding system can be adjusted to handle any size or type of laptop computer, including tablets. The desktop is made from an extremely rigid and durable plastic polymer, sits on an adjustable swivel point, allowing the Desktop to Swivel 360° and Tilt 320°. Ergonomic comfort while using your Jotto Desk mobile office desk is assured because of it's wide range of adjustability! The laptop Desk will work equally well if your vehicle has buckets or split bench seating. This Jotto Desk is passenger friendly; leaving plenty of room for a person to sit in the front passenger seat with the laptop Desk installed. When no laptop Desk is required, the Jotto Desk is easily removed, without tools, in seconds. The custom Chevy Avalanche Jotto Desk mobile computer mount was engineered for use in Cadillac Escalade for the years 2000, 2001, 2002, 2003, 2004, 2005, 2006, 2007, 2008, 2009, 2010 and 2011. The custom GMC Canyon Jotto Desk mobile computer desk was engineered for use in GMC Canyon Trucks for 2004, 2005, 2006, 2007, 2008, 2009 and 2010. The custom Chevrolet Bonneville Jotto Desk mobile computer Holder was engineered for use in Chevrolet Bonneville cars for 1996, 1997, 1998 and 1999. The custom Chevrolet Impala Jotto Desk mobile computer stand was engineered for use in Chevy Impala cars for for 2006, 2007, 2008, 2009 and 2010. The custom Chevrolet Camaro Car Jotto Desk mobile computer holder was engineered for use in Chevrolet. This Custom Ford car Jotto Desk mobile computer holder was engineered by Jotto Desk ® for use in Ford Fiesta, 2011. The custom Chevy Traverse Jotto Desk mobile computer holder was engineered for use in Chevy Traverse for the year 2009 and 2010. The custom Ford Escape SUV Jotto Desk was engineered for use in Ford Escape SUV's for the years 2001, 2002, 2003, 2004, 2005, 2006, 2007, 2008, 2009 and 2010. 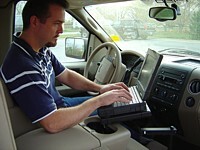 The custom Lincoln Navigator SUV Jotto Desk mobile computer stand was engineered for use in Lincoln Navigator SUV's for the years 2000, 2001, 2002, 2003, 2004, 2005, and 2006. The custom Ford SUV Jotto Desk was engineered for use in Lincoln Aviator SUV's for the years 2000, 2001, 2002, 2003, 2004, 2005, 2006, 2007, 2008, and 2009. The custom Ford F150 Jotto Desk was engineered for use in Ford F150 trucks (with 60/40 split bench) for the years 1998, 1999, 2000, 2001, 2002, and 2003. The custom Ford SUV Jotto Desk mobile computer Desk was engineered for use in Ford Explorer SUV's for the year 2011. The custom Ford Van Jotto Desk mobile computer mount was engineered for use in the 2010 Ford Transit Connect. The custom Ford Van Jotto Desk was engineered for use in Ford E-Series Vans for the years 1999, 2000, 2001, 2002, 2003 2004, 2005, 2006, 2007, 2008, 2009 and 2010.